19-year-old Héctor Choc was beaten to death outside El Estor, Izabal, on March 31, Choc’s family and Rights Action reported on April 11. José Ich is a witness in trials related to his father’s murder during a 2009 protest against the Fénix nickel mine, which at the time was owned by Canadian multinational Hudbay Minerals. Ich’s father, Adolfo Ich Chamán, was a popular local teacher and community leader who opposed the mine. At the 2009 protest, he was reportedly beaten, hit with a machete, and shot by mine security forces. In the same incident, another man, German Chub, was shot and remains paralyzed from the waist down. Last year, a Guatemalan court acquitted the mine’s head of security, former Guatemalan Army Colonel Mynor Padilla, of the assaults. The case remains open, however, in Canada, where Hudbay Minerals faces three related lawsuits: one for Ich’s murder, one for the assault on Chub, and another brought by 11 Q’eqchi’ Maya women who say they were raped by mine and Guatemalan government security forces when they were evicted from land claimed by the mine in 2007. The lawsuits could set a major precedent for holding multinational mining companies liable in their home countries for crimes committed by subsidiaries or contractors operating their mines abroad. The Choc and Ich families have faced repeated attacks and death threats for their opposition to the mine. New York University’s North American Congress on Latin America (NACLA) reports that Héctor’s uncle Ramiro Choc was imprisoned from 2008 to 2014 on “trumped-up” charges of stealing land, aggravated robbery, and other crimes. He was arrested shortly after mediating a land dispute between a major landowner and a Q’eqchi’ Maya community. Ramiro Choc has been involved in peaceful indigenous community rights campaigns since the 90s. 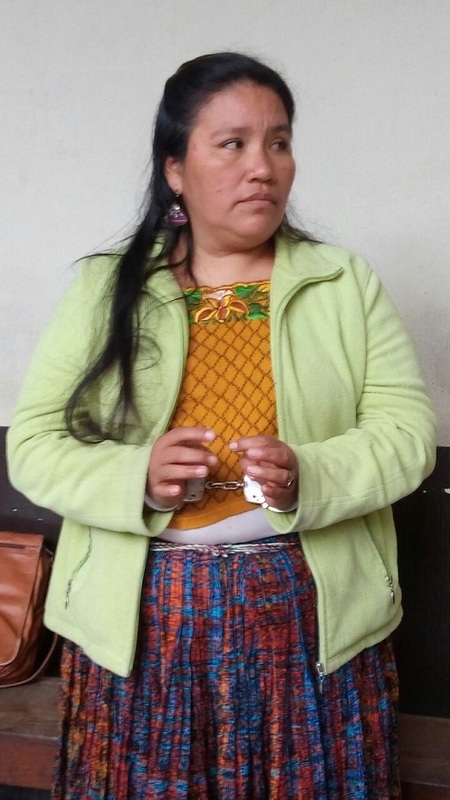 In January 2018 Ramiro’s sister, María Choc, was also imprisoned under similar circumstances. María Choc in court in Izabal. Photo by CPR-Urbana, obtained from CMI Guatemala. The present conflict between Q’eqchi’ Maya communities and large landowners and multinational corporations in Izabal is rooted in centuries of similar disputes.